Submitted photos Elliott Brown, the Ohio Research Scholars Endowed Chair in Sensors Physics, is part of a team that developed a new kind of LED light. Weidong Zhang is a research physicist in the Department of Physics. FAIRBORN — A scientific breakthrough that promises to make the LED lighting in everything from table lamps to streetlights more efficient and affordable is a step closer to reality thanks to help from Wright State University researchers. “It has been recognized at the highest levels in the research field of photonics, having been accepted in the Oct. 27, 2017, edition of Nature Light: Science and Applications,” said Elliott Brown, the Ohio Research Scholars Endowed Chair in Sensors Physics at Wright State. 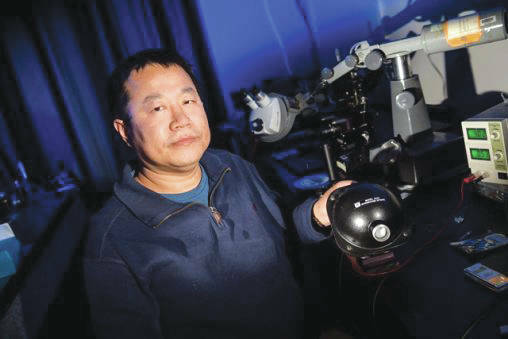 Brown; Weidong Zhang, research physicist in the Department of Physics; researchers T.A. Growden and P.R. Berger at The Ohio State University and D.F. Storm and D.J. Meyer at the U.S. Naval Research Laboratory have developed a new kind of light-emitting diode, or LED, made from the semiconductor material GaN to shine brighter while wasting less energy. LEDs have many advantages over incandescent lights, including lower energy consumption, smaller size and longer lifetimes. They are used in everything from automotive and aircraft lights, advertising, traffic signals and camera flashes. “The average user probably doesn’t care what semiconductor is inside their LED. But they do care about LED lighting,” said Brown. An LED is a two-terminal semiconductor light source. When voltage is applied to the leads, electrons recombine with holes in the device and emit energy in the form of photons. The color of the light is determined by the energy band gap of the semiconductor. LEDs have struggled to deliver high brightness for the shorter-wavelengths — the blue and violet parts of the visible spectrum. Blue LEDs were first made out of II-VI semiconductors like zinc selenide, but those were quite inefficient. Then a III-V material came along in the form of gallium nitride, and it totally changed the landscape of semiconductor light emitters, including LEDs and lasers both (and led to the 2014 Nobel Prize in Physics for S. Nakamura, et al.). But it is expensive and more difficult to grow and fabricate than more traditional light-emitting semiconductors like GaAs. One reason for the difficulty is that making the contacts for the semiconductors (GaN) — the P-type contact in particular — is difficult. The mobility of holes through the P-contact on GaN is very low. This prevents efficient hole injection for light emitting. Zener tunneling creates the holes necessary for the electrons to recombine and release the light-emitting photons. This Zener tunneling can be significant because of the high polarization fields within the GaN-based semiconductor heterostructures. The upshot is that tunneling enables the blue spectrum of LED lighting to shine brighter without expensive PN-based LEDs in GaN. This could also potentially make GaN-based LEDs more efficient and more affordable. The research was funded by a grant from the Office of Naval Research. And it has led to a United States (Utility) Patent Application and proposals for follow-on support. 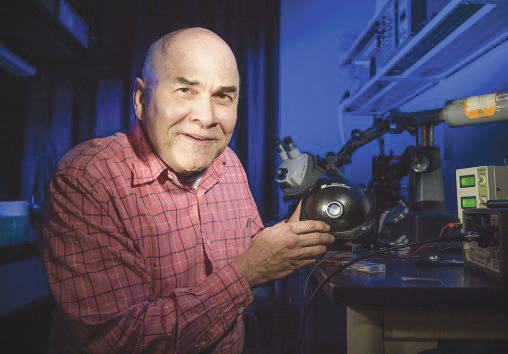 https://www.xeniagazette.com/wp-content/uploads/sites/32/2018/01/web1_elliott-brown-19719_007-508×354.jpgSubmitted photos Elliott Brown, the Ohio Research Scholars Endowed Chair in Sensors Physics, is part of a team that developed a new kind of LED light. https://www.xeniagazette.com/wp-content/uploads/sites/32/2018/01/web1_Weidong-Zhang-19719_013-508×339.jpgWeidong Zhang is a research physicist in the Department of Physics.